I went down to the kitchen to get some ice and on the bottom cupboard by the fridge was this monster. This is the biggest @*#&$!!#*%!! spider I have ever seen in my entire *@#%! *$&%# life!! He is probably about 4 inches across. Thanks, I don’t need ice that bad…. and thank god for zoom lenses…..
I’m generally not even afraid of spiders, but right now I’m pretty much freaked! Well, it depends on what you mean by ‘gone’…. I mean, I didn’t see it this morning when I went downstairs, so…. it could be hiding anywhere……. No, I didn’t even think of doing that! Honestly, though, I’m not sure it would have helped. I mean, if lizards can get in and out of my room all the time (which they do) I probably can’t keep a spider out. 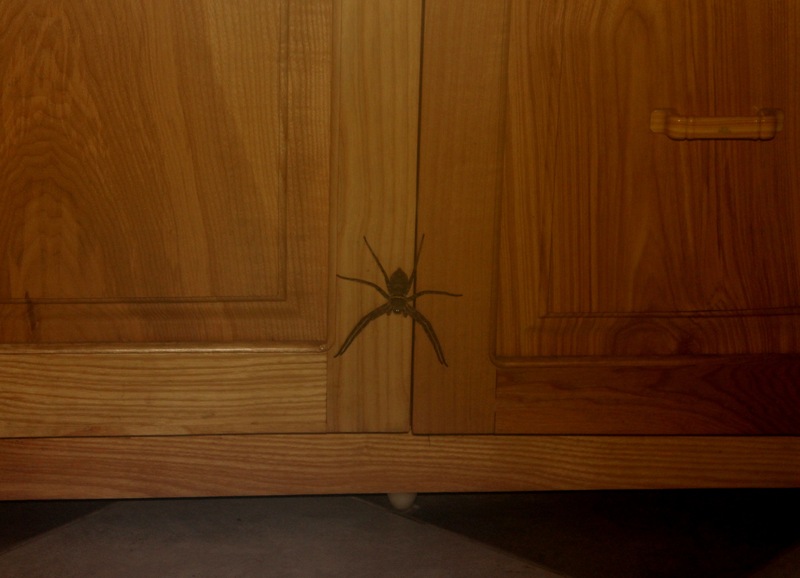 Thankfully, the spider is two floors down in the kitchen…..and I hope he’s happy there. The spider looks beautiful – BUT – it isn’t in MY kitchen! It would make a great “child-proofing” latch for the cupboard! Looks like it’s guarding your food. It really was a fascinating looking creature. I would have looked at it much more closely…..if it had been in a glass box! It’s funny – when I was coming down the stairs, I saw it on the cupboard at a distance and did a double-take. My first thought was, “Okay, who put the fake spider on the cupboard? !” I didn’t think there was any way that thing could be real. It would totally freak me out — gave me the creeps from however many miles away and through a computer screen! Appreciated your post before this about changing perspective. I have had similar thoughts — so much to be grateful for and its OK to realize when all is not as I would have it be too. Much love to you.